Wrap it Up #8: Easy fabric gift bags - C.R.A.F.T. Welcome to the 4th day or the 8th tutorial in the Wrap It Up series, all about clever and unusual DIY gift wrap ideas! So far we’ve had dish towel gift wrap, DIY fabric stamped gift wrap, wrapping with a pillow case ideas, fabric scrap bow ties, cupcake liner bows, DIY photo gift wrap paper, stamped kraft paper, and now we’ve got super easy fabric gift bags! Perfect for small gifts! My favorite part is that these little bags are reusable! Hey everyone! I’m Jennifer from Ellison Lane: Modern Sewing & Design, and I’m excited to be guest posting here today as part of the Wrap It Up series. I design sewing patterns, blog about sewing and quilting and host Sew South, a modern sewing retreat in Charlotte. I’m also a mom to two young kiddos and wife to a sweet and supportive husband who doesn’t mind that our dining room is craft central! I love making things that are both beautiful AND useful and adding a touch of handmade to just about everything. 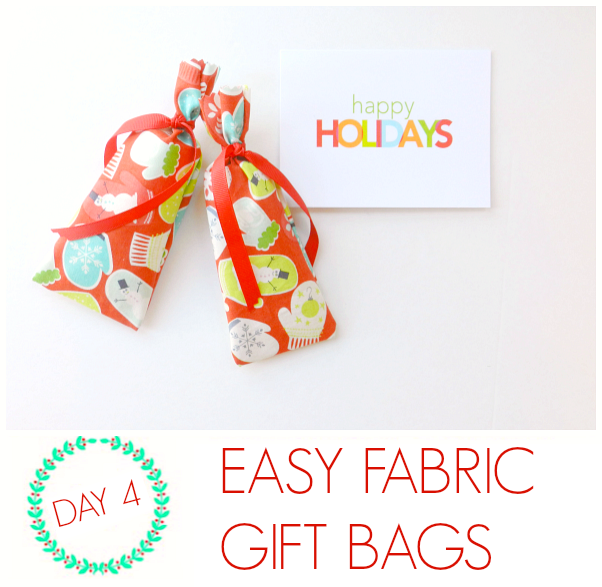 Today I’m sharing a tutorial for quick and easy fabric gift bags. These can be adjusted to any size but they are especially good for small gifts. Grab a favorite fabric and add a special, personal touch to any gift. These would be fun to wrap cookies, soaps, candy, nail polish, special pens, jewelry, etc. Fill stockings with special treats in fabric bags or make a bunch of these for favors for a party. 1. With a gift in mind, cut your fabric to size, leaving a 1/2″ seam allowance on both sides and about 3″ extra on the top. 2. Place fabric right sides together, sew both sides with a 1/4″ seam allowance and backstitch at the beginning and end, about 1/8″ from the top. 3. Trim the seam allowance with pinking shears as well as across the top. Turn right side out, poke out corners and press. 4. Slip the gift inside and tie with a ribbon. Ta-da! * For my gift, I used small tubes of Trader Joe’s hand cream (which I LOVE.) I cut one piece 13.5″ x 3.5″ and folded it RST, sewing each side. See? Quick and easy but oh so cute! Have fun making these. The possibilities are endless and you’re only limited by your imagination! If you’re looking for crafty holiday inspiration, check out the tutorials in my Deck the Halls series as well as the Holiday Hostess tutorials. They make great gifts too! Thanks for having me here today Jamie. Merry Christmas and Happy Holidays everyone! Thanks for having me as part of the series Jamie!